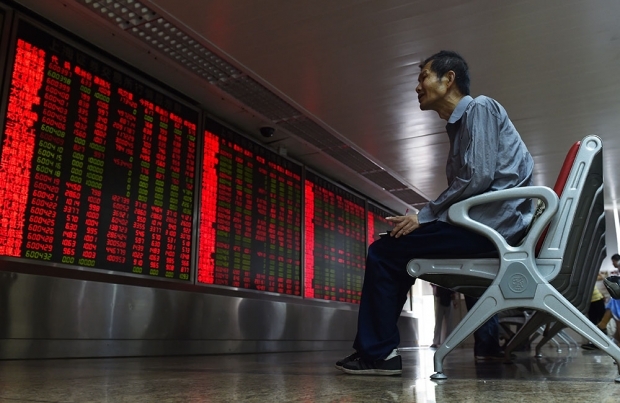 An investor looks at a display showing stock market movements at a securities company in Beijing. By Shang-jin Wei, the chief economist at the Asian Development Bank. This article was first published by Caixin. It would be a sad end to an amazing story. An economic miracle—one that lifted 300 million people from poverty and shifted the world's economic center of gravity—collapsing under the weight of risky investments and a financial crisis. This seems to be the theme about the Chinese economy of many commentaries in the international media following the recent stock market turbulence and changes in the exchange rate mechanism. Growth collapse to as low as 1 to 2 percent has been suggested. The volatility in the stock market seems to have confirmed the most pessimistic claims. The idea that the Chinese economy is entering a deep slide just isn't supported by the totality of the evidence. To be sure, a slowdown in the country’s GDP growth is real, reflecting changes in domestic fundamentals, including less favorable demographic forces and higher wage costs, a shift toward service sector development and domestic consumption with less emphasis on exports and investment, and lower demand from weak advanced markets. However, the recent turbulence in the stock market and the exchange rate movement are not a predictor of an imminent collapse in growth, nor are they a harbinger of a global recession. It’s true that growth in China decelerated more than expected in the first half of 2015. Growth in fixed investment and trade has looked particularly weak. If one wants to look for reasons to be pessimistic, one can find them. But other important indicators show an uptick—such as retail sales and housing. Perhaps most importantly, labor markets remain healthy, as shown by the 7.2 million net new urban jobs, particularly in services, in the first half of the year. This has been coupled by strong, uninterrupted wage growth. But can we ignore what the stock price is telling us about the real economy? Stock price movements generally do not tell a lot about the real economy over the medium term. For example, when the real economy in China was growing strongly during from 2010 to 2013, stock prices fell. By contrast, just as stock prices skyrocketed in the first half of 2015, the slowdown of the real economy was taking place. The reasons are not hard to understand. For one, firms listed on Chinese stock exchanges simply aren't very representative of the universe of Chinese companies. For example, while a majority of state-owned firms account for two-thirds of listed firms in terms of market value, they account for no more than one-third of GDP and an even smaller share of employment. Moreover, the market has substantially more retail investors and fewer institutional investors—a sharp contrast to more developed markets in the United States or Europe. While many institutional investors look at long-term fundamentals, which help to stabilize the market, most retail investors tend to focus on short-term gains and momentum trading, which tend to magnify the volatility. Markets with such an investor base tend to create more of a disconnect between stock price movements and real economic growth. To understand the run-up of stock prices one needs to look at the fact that Chinese have limited investment options and that deposit interest rates were held down by a ceiling until recently. This was coupled in the first half of the year by editorials in major Chinese dailies that encouraged an optimistic view of stock prices. When the alternatives are limited and they don't pay well, a positive story about the stock market looks even more attractive. By the same logic, some of the stock price adjustment may be a consequence of several developments in the economy. These include the talk of removal of the deposit interest rate ceiling (which was eventually implemented), more widely available shadow banking products that offer a better interest rate than traditional bank deposits, and increased ease with which wealthy households can take their savings out of the country bundled with an anticipated increase in the U.S. interest rate. By having more alternatives—many with higher returns—to investing in the stock market, households would find it sensible to relocate part of their savings out of the domestic stock market, leading to some downward pressure on prices. In addition, as Harvard’s Jeffrey Frankel has pointed out, regulators increased margin requirements several times this year, making it harder to buy stocks on borrowed money. This also added a “push” factor to the previous list of “pull” factors. While China has a good chance to continue to achieve relatively strong growth, it is not automatic and would require vigorous policy reforms. While the country has policy space to lower required reserve by banks and lower interest rates, I favor other policy reforms that can simultaneously promote desirable structural changes in the economy. Reforms of state-owned firms together with changes in the financial sector that would allow more resources to flow to the most productive firms would be very meaningful. The time has also come for a fiscal reform that lowers the tax burden of firms, including the payroll tax. While China used to have one of the most flexible labor markets, adjusting the workforce based on market needs has become more difficult for firms in recent years. Reforms that improve the flexibility of the labor market are also in order. While labor market reform may not stimulate short-term growth, it will help the country to improve resilience to future negative shocks, whether they originate at home or abroad. As for the world economy, over the medium term, China will remain the largest single-country contributor to global GDP growth. Don’t panic about the volatility in the stock market.